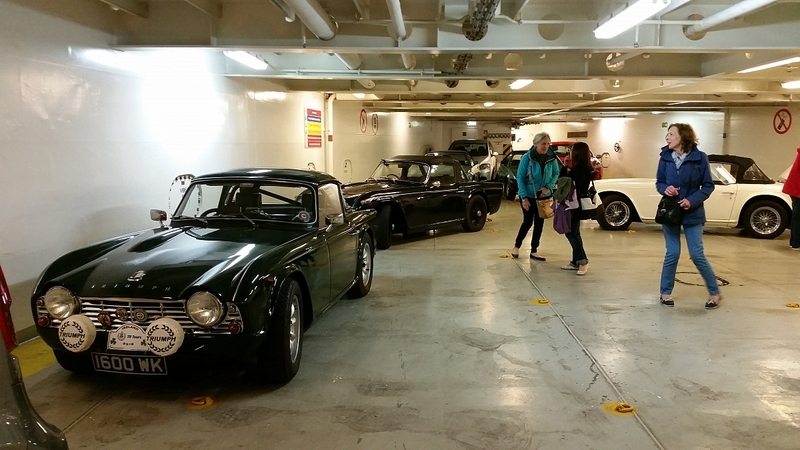 The car was packed with tickets, passport and money but, hang-on, we are going to Ireland by ferry – did we need a passport? No, as it turns out. The nice lady in the Garda uniform just asked if we were British. Yes, we replied, can't you tell? An old British car with no roof, in the gentle rain, with two well wrapped up people trying to get out onto the open road as soon as possible so we didn't get too wet, could we be anything else? 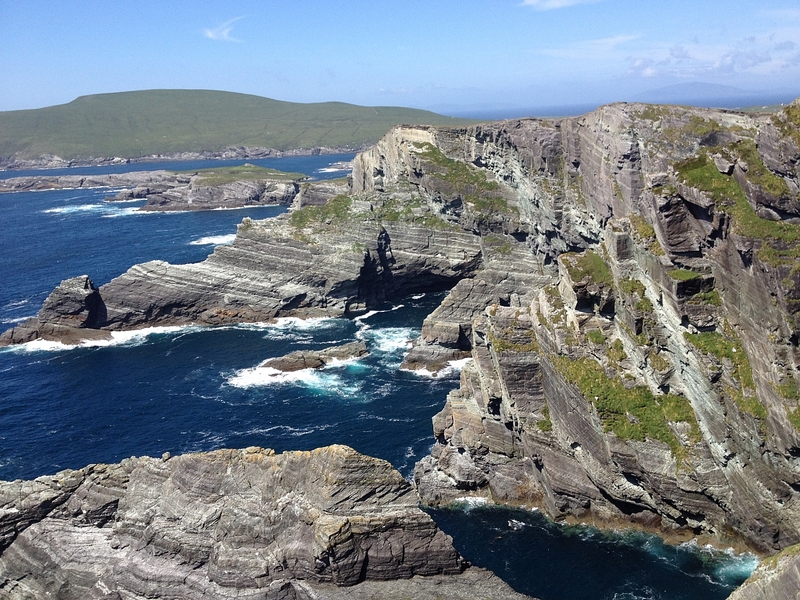 Such lack of formality was a sign of things to come as we were welcomed to the Emerald Isle. 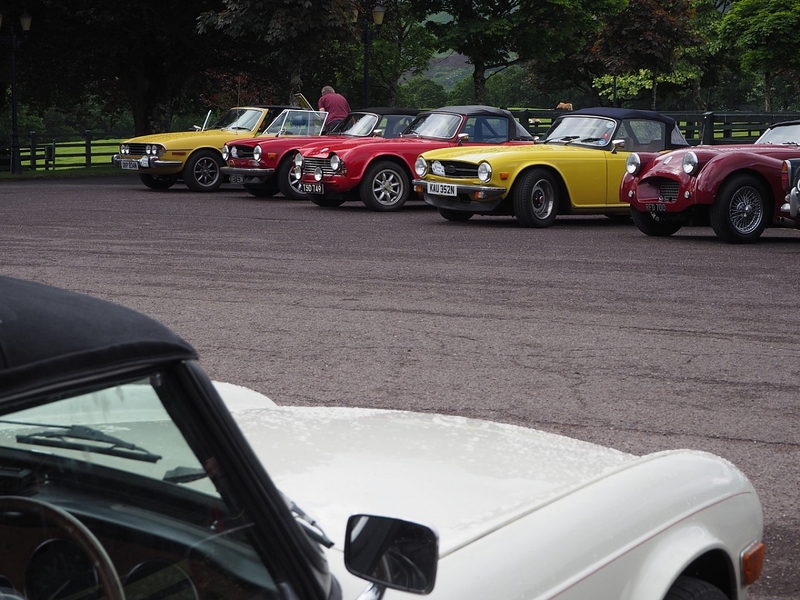 23 cars and crews had signed up for the inaugural TR Tours trip to Ireland. Most of us met in the car park of the Travelodge in Holyhead early on the Monday morning. Not an overly auspicious start to a wonderful holiday but it was convenient, being only 3 minutes from the Stena Line Ferry terminal for our 08.55 departure to Dublin. The Irish sea was like a mill pond and the ferry glided across it without a roll or pitch, much to the relief of a few of us. With all the formalities out of the way we headed out on our way down to Killarney, via the Dublin ring road and the motorway to Limerick. All very boring but hey, it would get the journey done in reasonable time, or so we thought. Three hours later we were still going, as was the rain, and after a diversion for a closed motorway we finally hit the smaller roads taking us through some delightful towns and villages. Adare looked well worth a visit at some other time but not for this trip. We did notice that each time we came into a town and had to slow down or stop, the rain increased in intensity just enough to keep us nicely wet. The rain and the traffic made the journey feel much longer than the 200 miles that TomTom told me it was, but it was never bad enough that we had to put the roof up. We finally, at 6.30 pm, made it to Killarney and the Hotel Dunloe, our refuge for the next 4 nights. It was like coming across an oasis of luxury in a desert of greenery and rain. 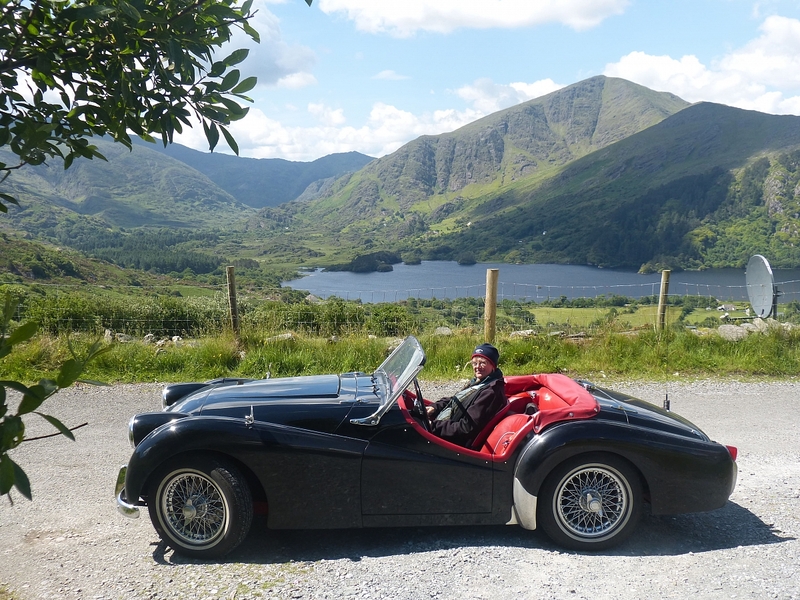 We were greeted with hot towels at the check-in desk, a large room with a view across to the Gap of Dunloe and a very warm comfortable bed – wonderful. Not many crews knew each other so there was a welcome BBQ organised for the first evening. Alas it had to be held indoors but it still proved effective as a "get to know you" as introductions were made around the tables. Names were instantly forgotten, of course, no name badges here, we were too relaxed for that formality. We had a nice surprise when Mervyn and Daphne Jeffers from the local TR Register Ireland group showed up and introduced themselves. They stayed for dinner and joined us for the next few days tours in a very pretty white TR3a. Their local knowledge was much appreciated. 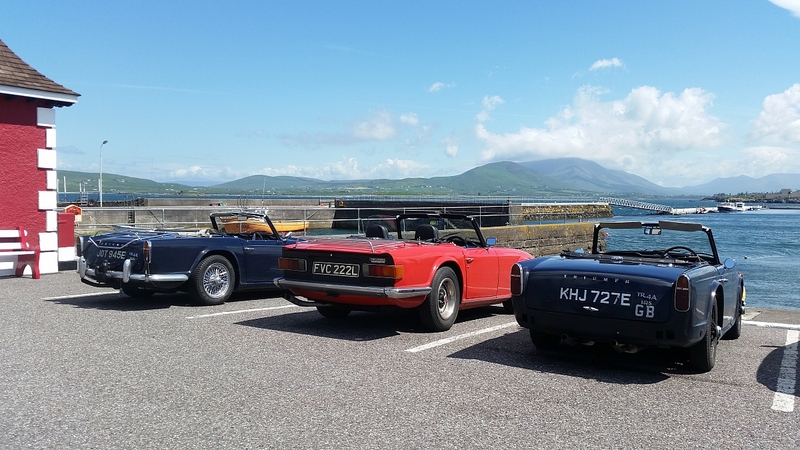 The first day of touring started a bit damp but several cars still had their hoods down as most of the cars set off following the very well researched and written route guides out towards the Dingle peninsular. Even on the first day several crews decided to opt for a different route or a rest after the previous days long drive; the flexibility inherent in this of touring was already proving a hit with many. Being based at a single hotel for 4 nights meant that you could follow the suggested routes or do something completely different without problems. 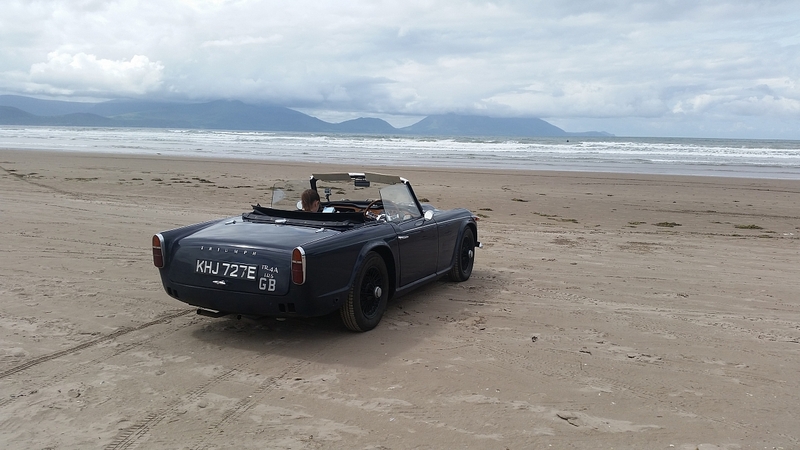 By the time we got to park on the beach at Inch, the sun was out so more tops were off (sadly only on the cars). 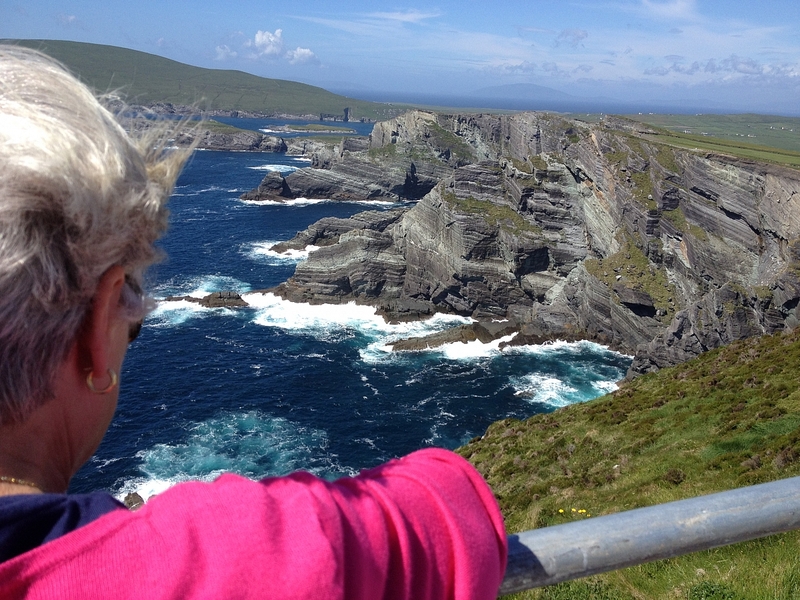 The town of Dingle was a real treasure, with some excellent Murphy's home-made ice cream. The roads around the headland of the peninsular have to be some of the most spectacular in Europe, narrow and twisty round the side of a cliff, and not too busy. Then the unexpected: two awesome passes over the mountains. The first was fast and furious with long sweeping bends, real TR country; the second was a single track road with sheep and more spectacular views. Only 125 miles but lots of WOW moments. 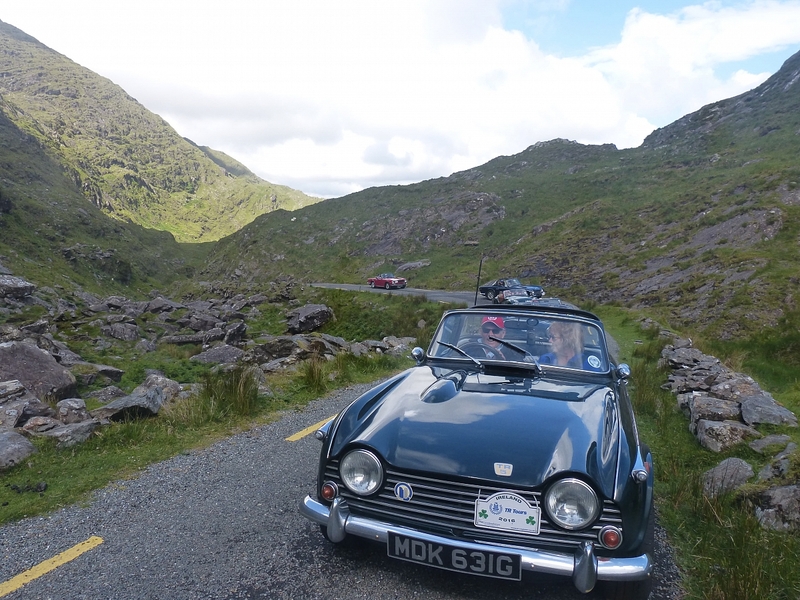 We were thrilled and exhausted by time we got back to the Dunloe for a hot shower. Earlier that morning, a number of people had expressed a desire to go into Killarney (8 miles away) for dinner and a look around the town. We counted heads to organise taxis but in the end there were 39 adventurous souls so the hotel fixed a coach. It turned out to be a vibrant town in the evening where we met all sorts of friendly people, and it had no shortage of good restaurants. We split up into groups to do our own thing but all made it back onto the bus on-time: everybody was still on their best behaviour. Next day brought drier weather with the promise of a bit more sunshine. We did hear that it was pouring down back in the UK, but none of us minded. 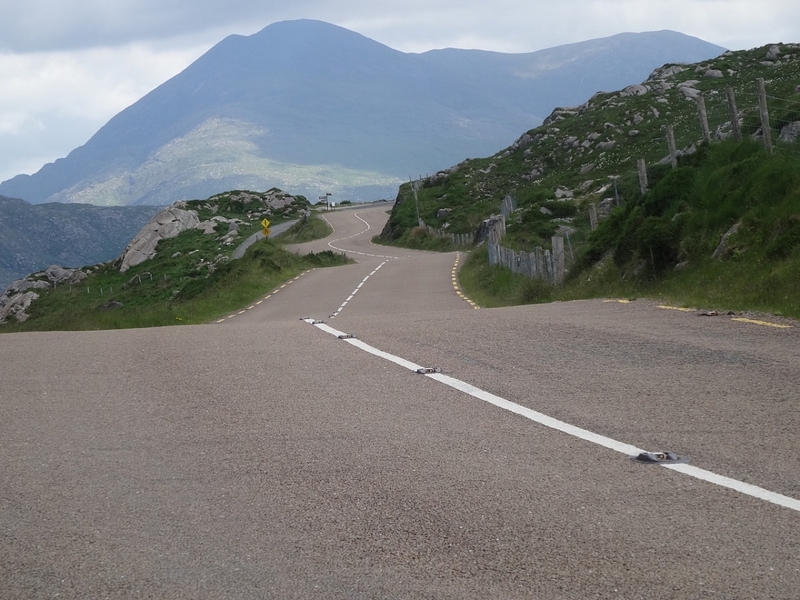 Today's suggested route took in the Ballaghbeama Gap and the Healy Pass, both of which proved to be entertaining: more narrow, twisty, empty roads with occasional sheep. A number of cars happened to join up at the top of the Ballaghbeama Gap so we completely blocked the road for 15min for a few (many) photos. Nobody came along to disturb us, it just shows you how empty the roads were. A few people had done some research ahead of time, by reading the supplied literature, or talking to Mervyn and Daphne, so opted for a short boat ride out to Garnish Island, off Glengarriff. The island is the site of a splendid garden laid out by Annan Bryce and Harold Peto, architect and garden designer, so the leaflet said (I am a horticultural numskull, but it looked quite pretty). The return run over Moll's Gap was ruined by a few slow coaches so the solution was to stop, admire the view, then set off again ahead of the next clutch. After a welcome shower and a glass of Guinness (not the first) we asked if anybody wanted to head back into Killarney. There was a resounding chorus of hell no, too tired; clearly the Guinness was hitting the spot. I don't think anybody moved far from the bar or hotel restaurant that night. 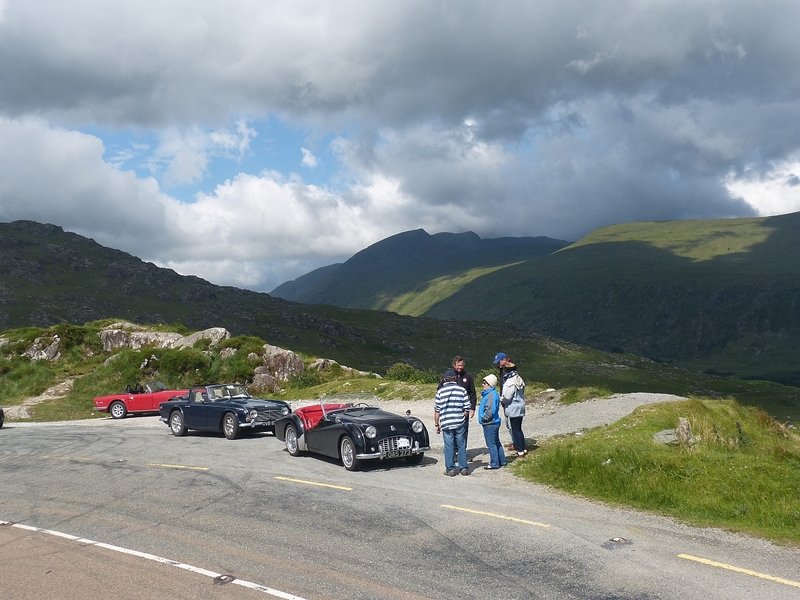 The final day's touring bought even more promise of sunshine so, hoods down, most cars headed off to the Ring of Kerry. Some people had already done this or fancied a change from driving so did a range of different things including fishing, walking, horse riding and jaunting carts (horse drawn). 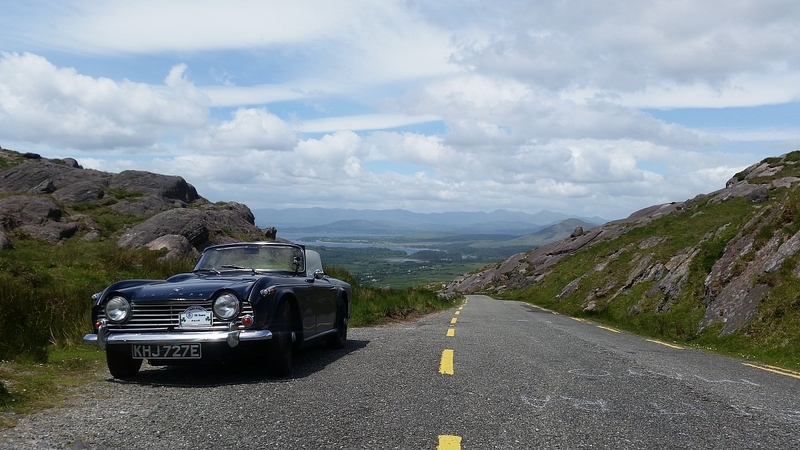 Sadly Paul and Susan's TR6 had suffered a broken shock absorber the previous day but, hero of the moment, John Biggin took Paul and his shock absorber into Killarney. They failed to find a new replacement but ended up at a small engineering company who welded it up to a much higher standard that the original. It was all back together and working by lunch time. Later that day, Bob Eccles found his spare sealed beam headlamp and passed it onto Alan and Val since their TR6 had been reversed into earlier in the week. Real TR spirit, well done and thanks guys. On Friday morning it was time to head off back to Dublin. 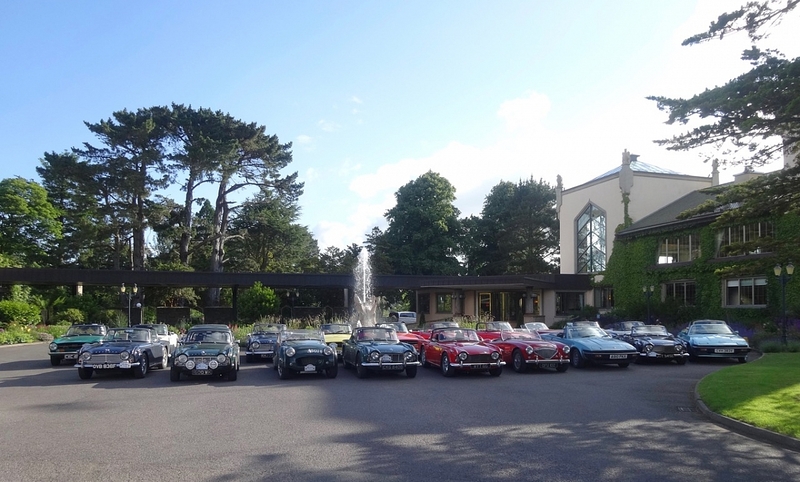 However a few people had suggested a group photo in front of the hotel, so everybody who could obliged and the cars did look splendid in the sunshine. The drive back to Dublin seemed much shorter this time, with no rain and no road closures, and TRs leaving and joining different groups throughout the route. Sadly Paul and Christine's TR2 started misfiring and, when they stopped at the toll booth, the engine stopped entirely and would not restart. Paul called a breakdown truck straight away as time was tight to the ferry, but in the meantime he continued to diagnose the problem. Before the truck arrived Paul had discovered a loose main HT lead which quickly resolved the problem and they were on their way again, and made the ferry with 20min to spare. So we all made it back safely with very few issues, given that some crews and cars had done very little touring or driven such long journeys before. It was a great first outing for TR Tours, and the feedback from the participants has been very positive. The best things were seen as the quality of the hotel and staff, the route guides plus the flexibility to do what you want, when you want, and was also seen as great value for money. Thank you to everybody who took part in the tour; joining in, making friends and helping each other – you made it a wonderful experience for all. Thank you too to Travel Destinations who recommended the hotel, researched and wrote the route guides, did all the preparation and bookings and delivered a first class travel experience. The most common question coming back to us at the end of the tour was: where are we going next? Our thoughts for next year are still coming together but are focused on Brittany in late June and Northern Ireland in late September. As they say, watch this space and the website for details. See you next year on a TR Tour.